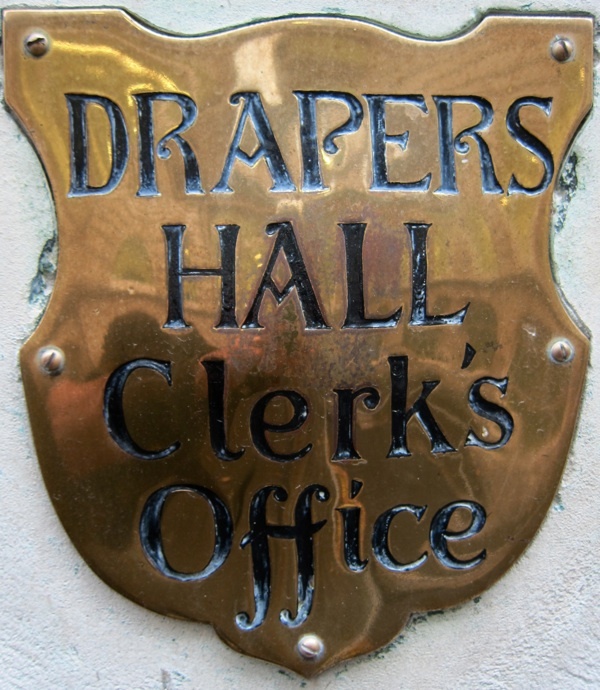 As long ago as 1180, the Drapers in the City of London formed a Guild to protect their interests as small traders and help members who fell into distress. 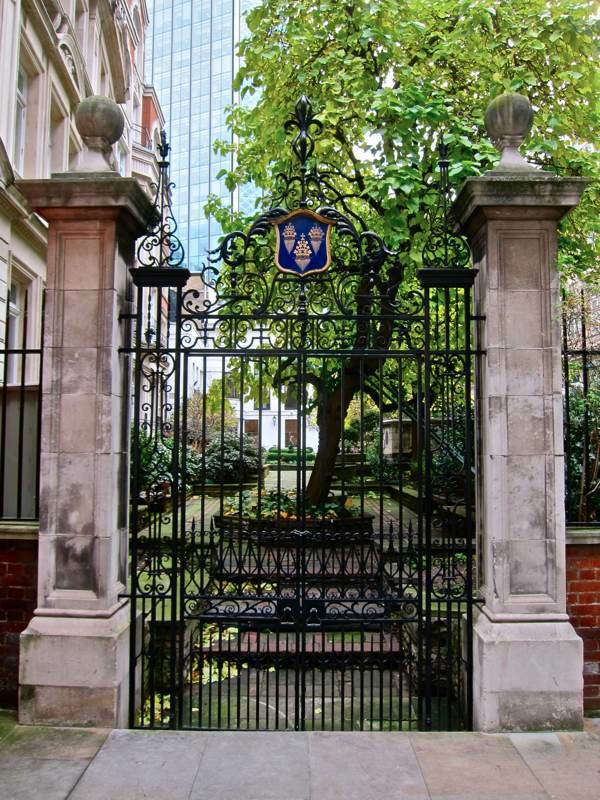 The full title of the company was, “The Master and Wardens and Brethren and Sisters of the Guild or Fraternity of the Blessed Mary the Virgin of the Mystery of the Drapers of the City of London.” More than eight hundred years later, it still exists to administer charitable trusts, inheriting headquarters that have been rebuilt over the centuries upon the site of Thomas Cromwell’s house – taken by Henry VIII after Cromwell’s execution at the Tower in 1540 and sold to the Drapers in 1543. 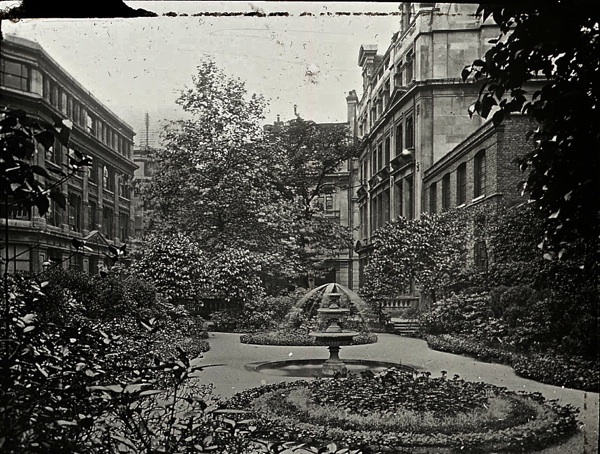 For years, I walked down Throgmorton Avenue and peered through the railings at the Mulberry trees growing there with out knowing that this tiny enclave of greenery in the heart of the city was the last remnant of Thomas Cromwell’s garden. 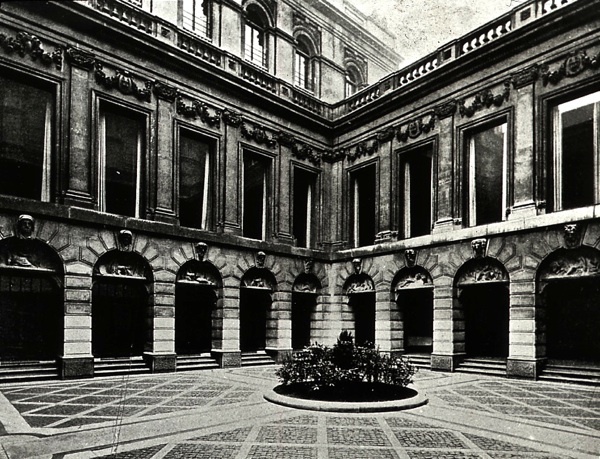 Consequently, I was fascinated to visit the Drapers’ Hall this week and explore the chambers of the ancient livery company arranged around a hidden courtyard, following the ground plan of the great medieval hall that once stood upon this site. 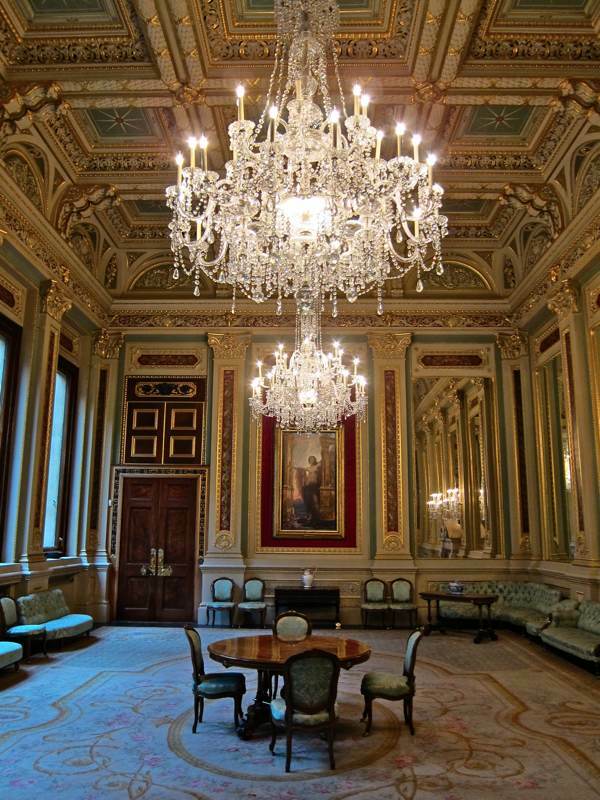 Until then, I had no idea that these palatial spaces existed, sequestered from the idle passerby. Cromwell’s mansion was destroyed by the Great Fire of 1666, then rebuilt to designs by Edward Jarman in the sixteen seventies and later remodelled in each of the subsequent centuries to arrive at the rambling construction I encountered, which delivers some breathtaking architectural contrasts as you walk from one space to another. 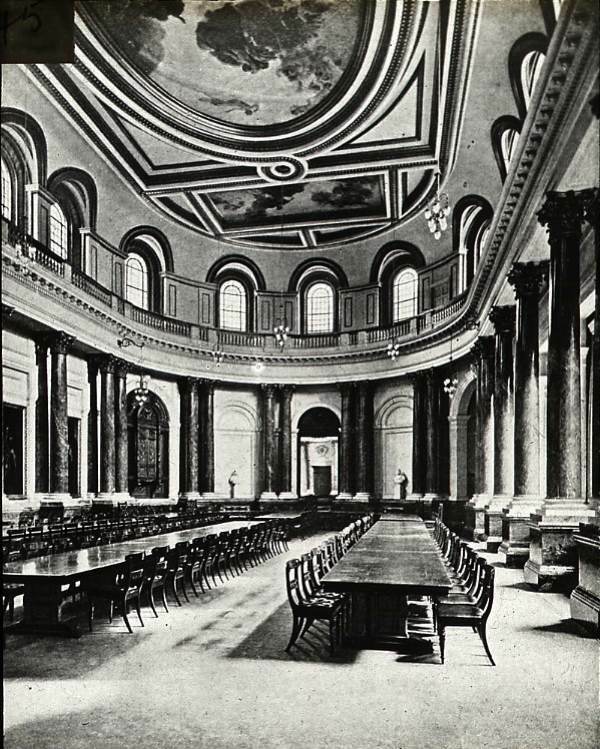 Offices occupy the ground floor that give no hint of the grandeur above, unless you step into the courtyard and raise your eyes to peer through the tall windows upon the first storey where the gleam of vast chandeliers reveals lofty painted ceilings. Standing there in the stone yard surrounded by an arcade embellished with heads of the prophets, you might be in Venice or Rome. 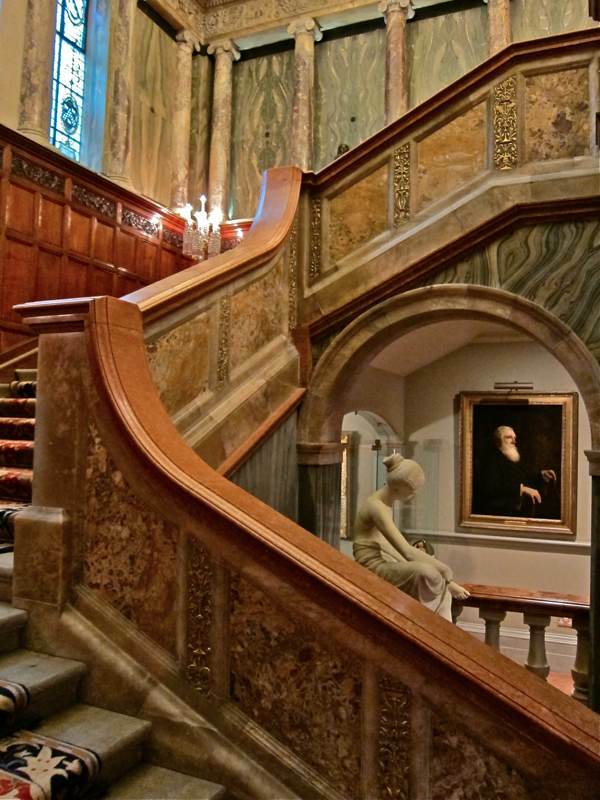 A magnificent eighteen nineties staircase by Thomas Graham Jackson, lavishly encrusted with alabaster and red emperor and green chipolina marble, and light by a five thousand piece chandelier, offers a suitable introduction to the wonders at the top, where the grand Dining Room awaits on your left and the even grander Drawing Room on your right. 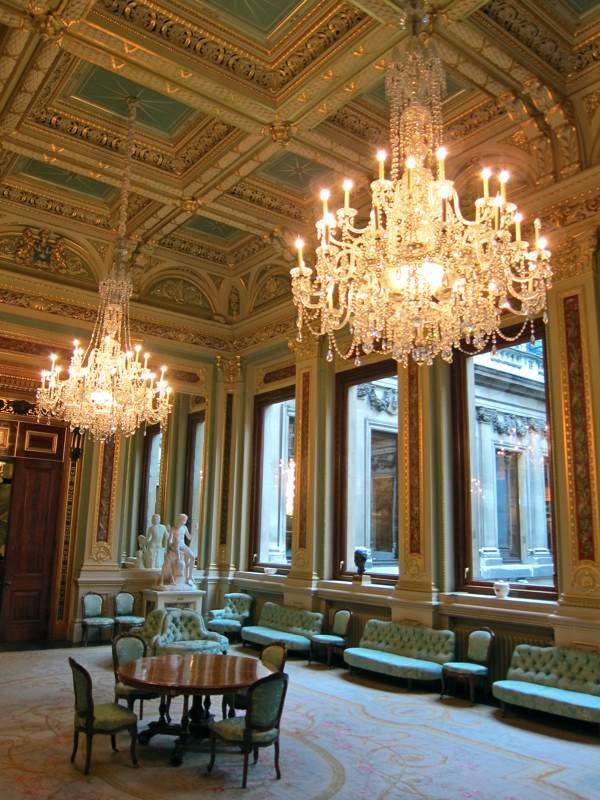 Overlooking the garden, the Dining Room is one of the oldest chambers at the Drapers’ Hall, dating from the seventeenth century yet heavily embellished with coats of arms in the mid-nineteenth century to create a shining firmament overhead, glistening in diffuse chandelier light. 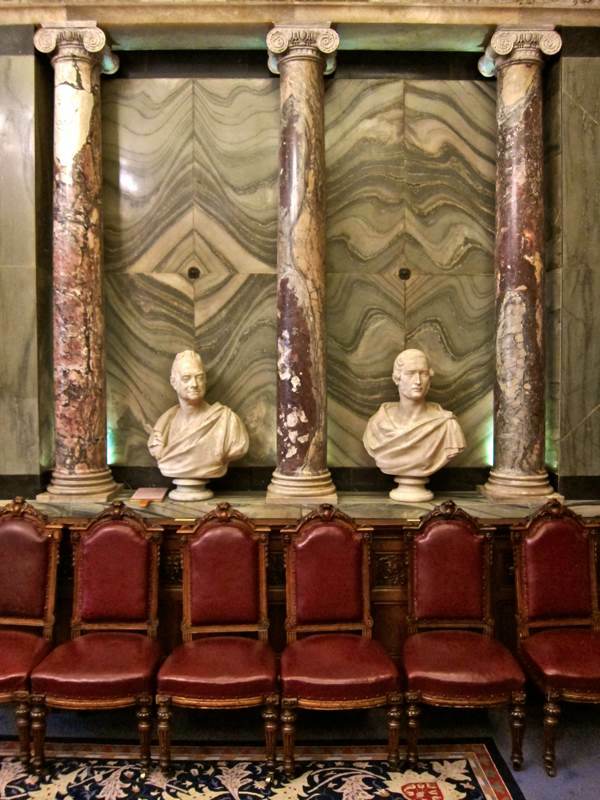 Crossing the landing, you enter the Court Room where Nelson and Wellington face each other from full-length portraits at either end. 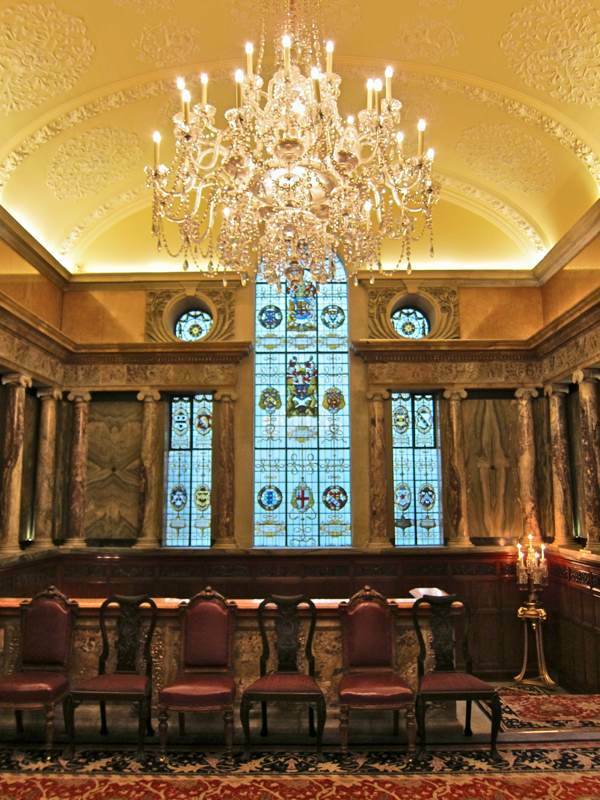 Lit by tall windows overlooking the courtyard, even the grandeur of this space gives no indication of the vast Livery Hall beyond. 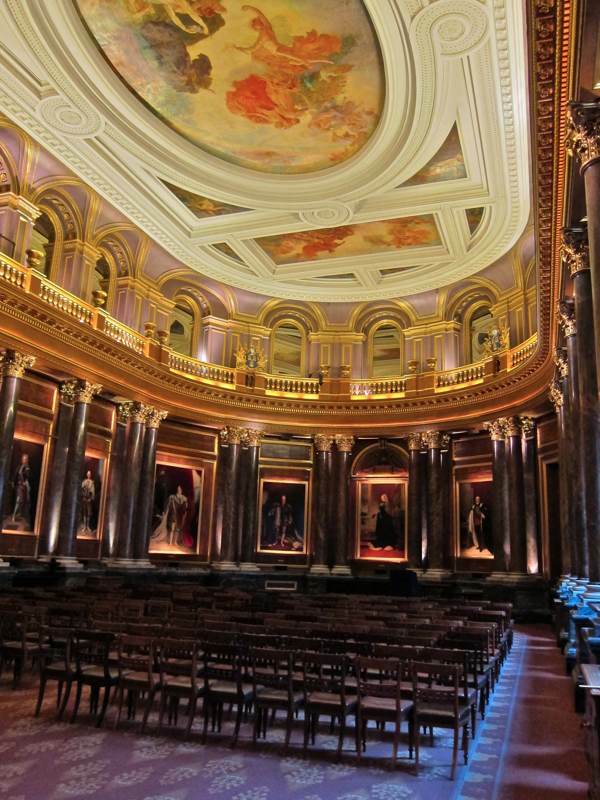 In the sepulchral gloom, larger than life-size portraits of British monarchs line up around the walls of this cathedral-like space, where no sound of the city penetrates and the depth of silence hums in your ears. 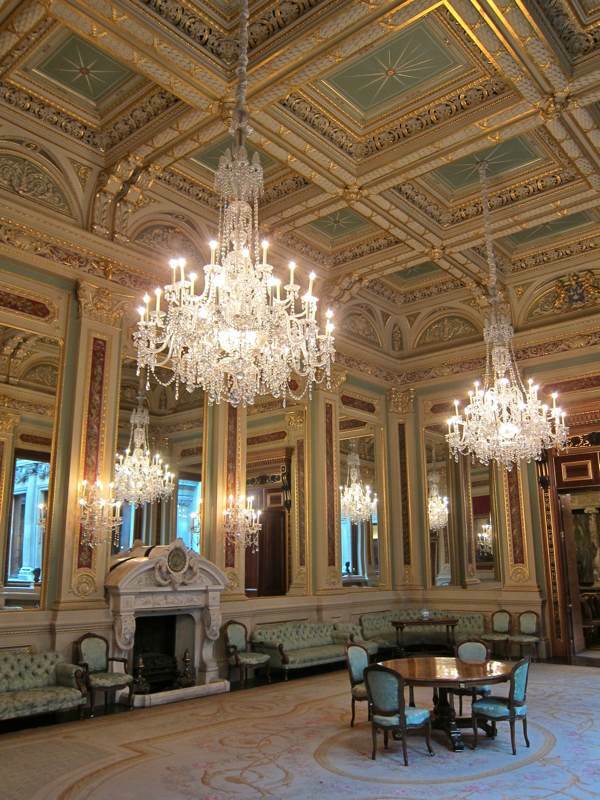 Incredibly, the embellishment in this ornate room was simplified in the eighteen nineties because the original decoration was so elaborate that it prevented the entry of light. 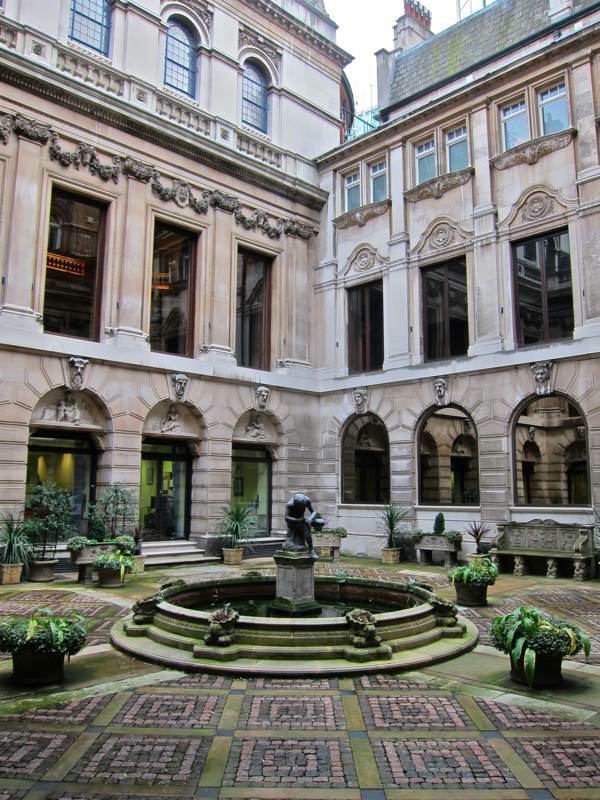 A narrow corridor leading from the hall and overlooking the courtyard holds the company’s succession of charters including Edward III’s Patent of 1364 followed by those granted by James I, Elizabeth I and our own Elizabeth II. 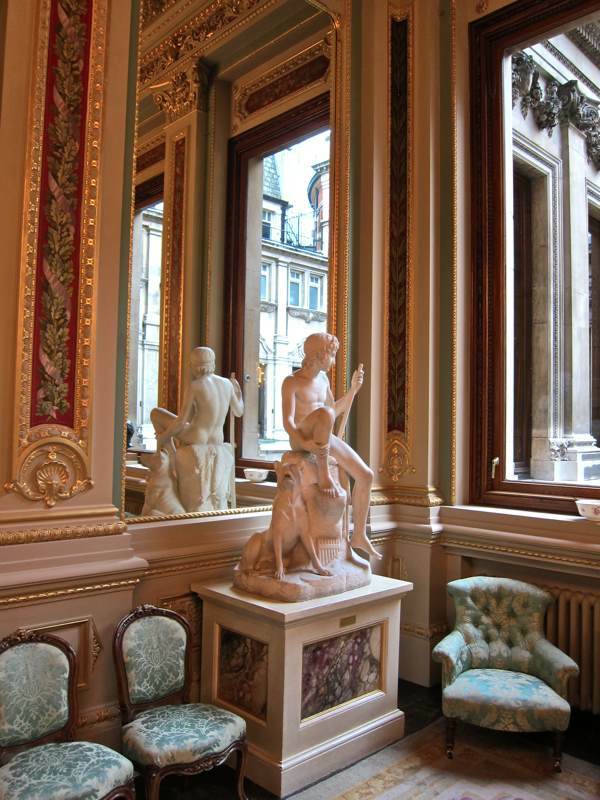 Facing the Livery Hall across the courtyard is the Drawing Room, a chamber worthy of any of the royal palaces of Europe. 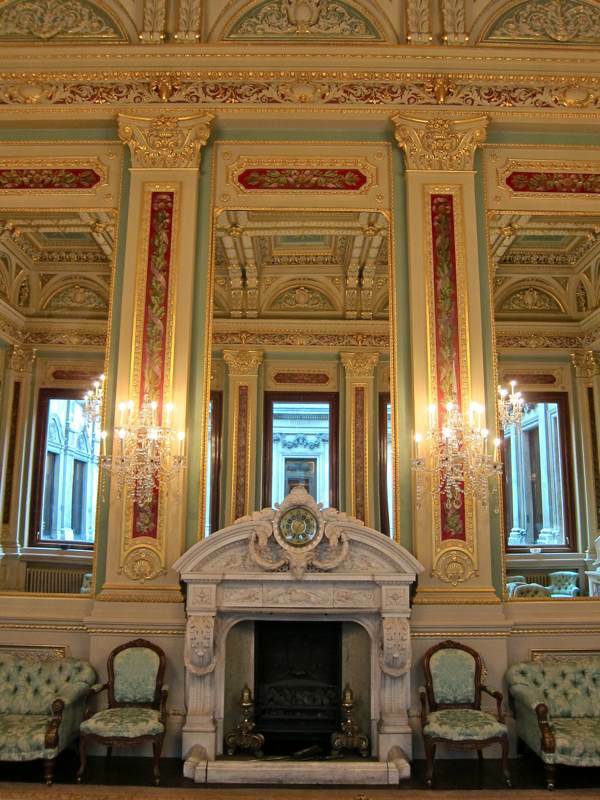 Created by architect Herbert Williams and interior designer John G. Crace, it remains as they left it in 1868, – an exquisitely modulated symphony of gilt panelling and mirrors, glowing golden in the cool northern light. 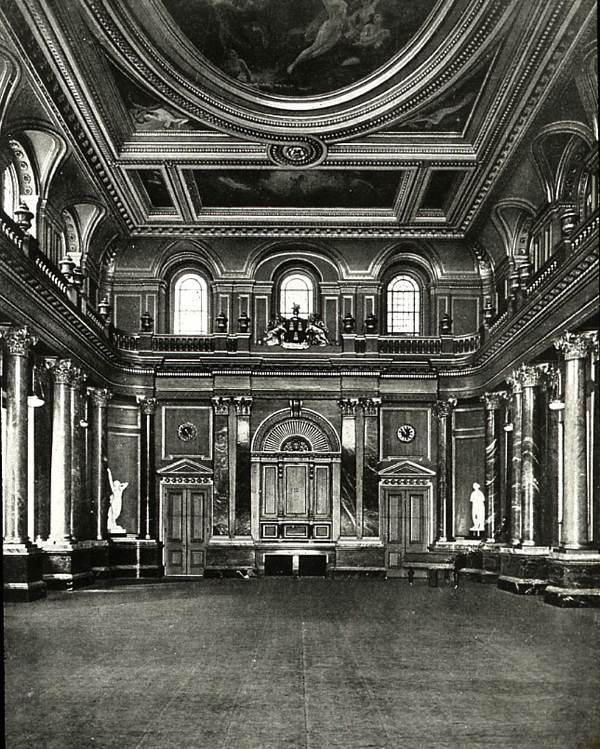 Over-awed by the majesty of the building and distracted by the collection of old paintings worthy of any museum, I rubbed my bleary eyes when I found myself back in the dusty streets around Liverpool St Station in the grey dusk of a November’s afternoon, and it caused me to question whether my visit to the Drapers’ Hall had, in fact, been an apparition conjured by a daydream. 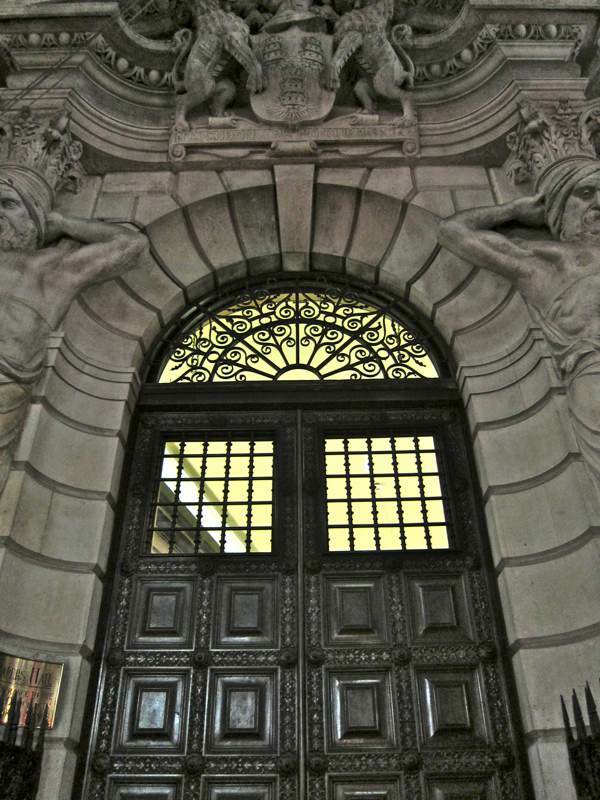 Bearded Persians by Henry Pegram flank the Throgmorton St entrance. 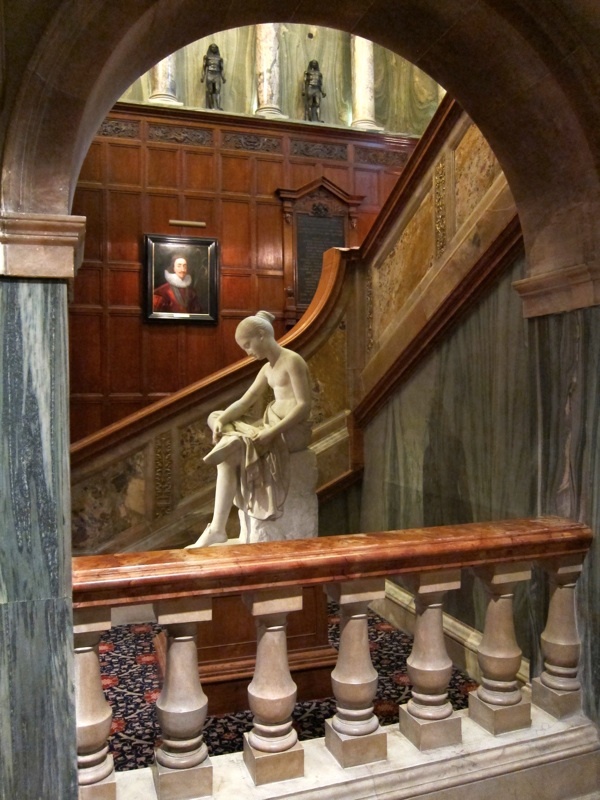 Staircase designed by Thomas Graham Jackson in the eighteen nineties. A five thousand piece chandelier lights the staircase. 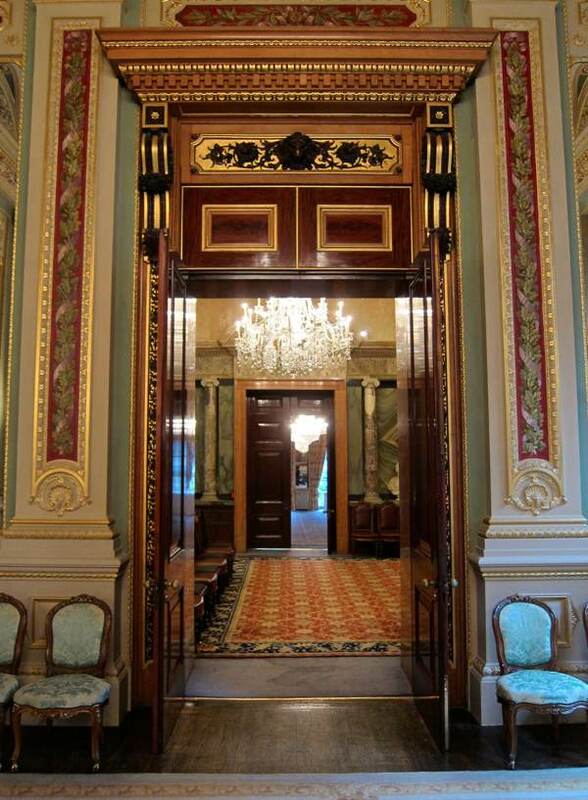 Looking from the Drawing Room through to the Dining Room. 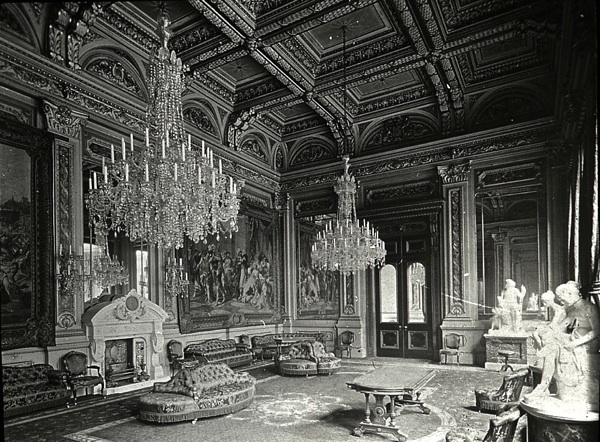 The Drawing Room by architect Herbert Williams and interior designer John G. Crace, 1868. The Shepherd Boy by Thorwaldsen, 1893. 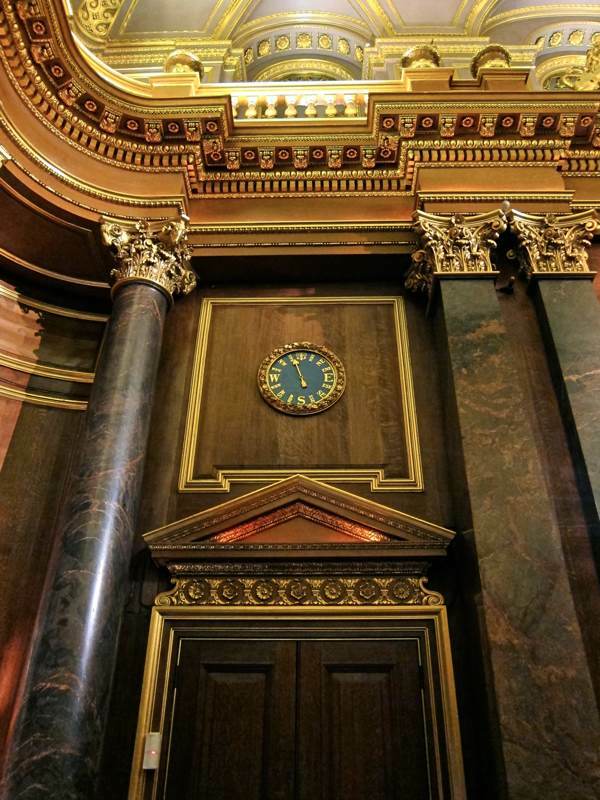 This dial in the Livery Hall indicates the wind direction. The last remnant of Thomas Cromwell’s garden. You can visit the Draper’s Hall on 3rd December for the Wellbeing of Women Christmas Fair 11am-8pm. An amazing place, like a palace. Magnificant. And a very well written piece. 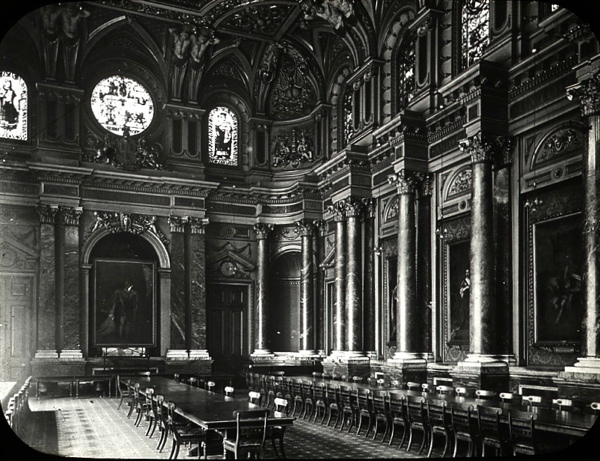 The colour photos show how grand it really is, which you don’t get from the old old black & white photos. Such a contrast! 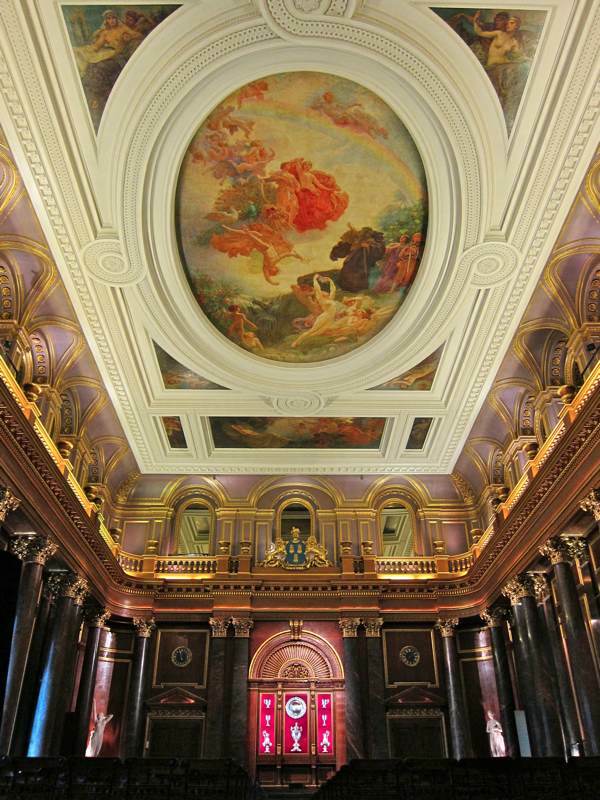 It makes me wonder how a Guild of Drapers would want to lavish such expence on a meeting place! 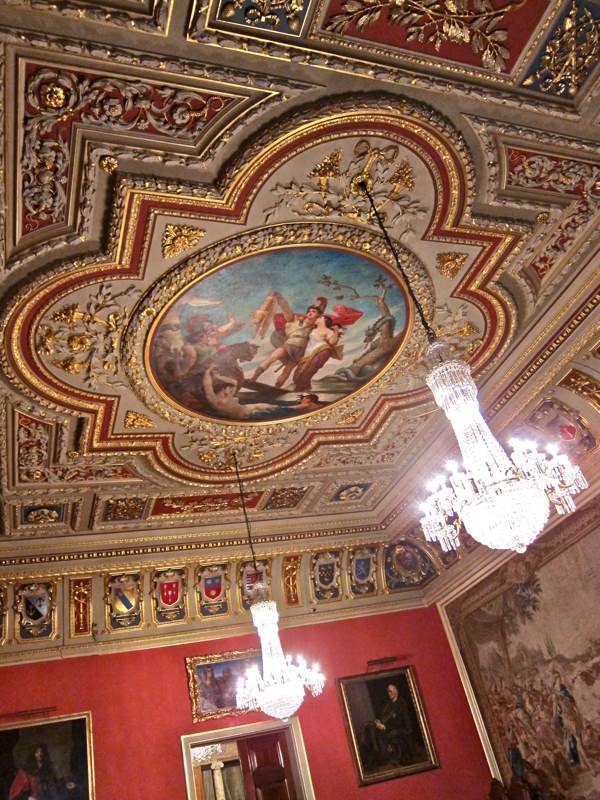 – as you say, as grand as any palace in Europe! They must have had a few bob! Many thanks for sharing with us. Jeez! Just think, in 832 years the East End Trades Guild could have premises like these. A must-go place of pilgrimage for devotees of Thomas Cromwell via Hilary Mantell’s WolfHall and Bring up the Bodies. 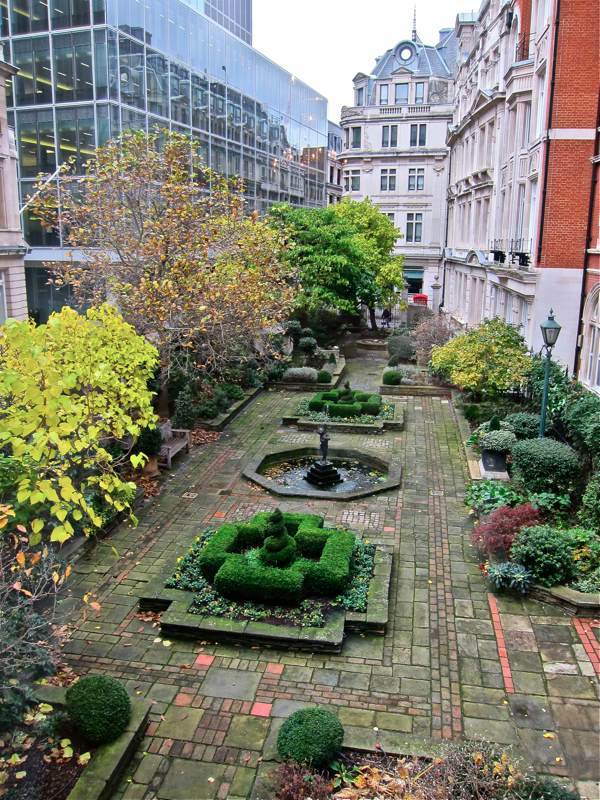 I’d wrongly located Thomas’s home on the other side of Austin Friars. So thank you for the information and pictures of his garden. I find myself asking: what is the source of all this wealth? You’d be hard pressed putting that on a t shirt. Love that women are included in the Guild. I suppose we should be glad it isn’t at Euston.